Kionix collaborates with many companies to create development tools and solutions that make it easier for our customers to incorporate Kionix accelerometers and gyroscopes into their designs. Below are descriptions of some of these tools and solutions. 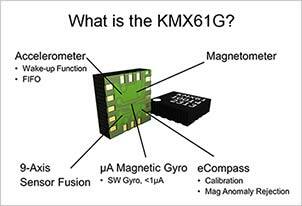 The KMX61G is the industry's first consumer level micro-amp magnetic gyro, providing a 9-axis solution from a single chip 6-axis magnetometer-accelerometer device. This high-performance product is enhanced with Kionix's proprietary sensor fusion software and auto-calibration algorithms to deliver highly accurate emulated gyro outputs with significantly lower power consumption than a traditional gyro. Kionix sensor fusion software is scalable, meaning it is designed to run on either an application processor or a sensor hub. Now, through our partnership with Atmel, we've added support for the new ARM-based SAM D20 sensor hub microcontrollers from Atmel. These new microcontrollers are flexible, easy to use, low power sensor hubs. Plus they come with a full set of tools from Atmel to help you get going fast. When matched with the Kionix KMX61G Micro-amp gyro, the result is a low power, high performance 9 axis solution for a wide range of applications and products including IoT, wearables, mobile phones, tablets, ultrabooks & convertibles and more. The new Atmel® SAM D20 family—based on the ARM® Cortex®- M0+ core—builds on decades of innovation and experience in embedded Flash microcontroller (MCU) technology. It not only sets a new benchmark for flexibility and ease-of-use but also combines the performance and energy efficiency of the ARM® Cortex®-M0+ core with an optimized architecture and peripheral set. This truly differentiated general-purpose MCU family is ideal for many low-power, cost-sensitive industrial and consumer applications. You can learn more about the Atmel SAM D20 ARM-Based Microcontrollers by watching the video "Atmel - Introducing the All-New SAM D20 ARM-Based Microcontrollers". Additionally, the KMX61G sensor fusion also runs on Atmel's 32-bit AVR UC3, and various low power Kionix accelerometers have been included in Atmel's AVR Studio® 6 Integrated Development Environment (IDE). About Atmel: Atmel Corporation is a worldwide leader in the design and manufacture of microcontrollers, capacitive touch solutions, advanced logic, mixed-signal, nonvolatile memory and radio frequency (RF) components. Leveraging one of the industry's broadest intellectual property (IP) technology portfolios, Atmel is able to provide the electronics industry with complete system solutions focused on industrial, consumer, communications, computing and automotive markets. The new Bluetooth® low energy SensorTag from TI, featuring the Kionix KXTJ9 accelerometer, is designed to shorten the design time for Bluetooth app development from months to hours. The SensorTag kit is the first Bluetooth low energy development kit focusing on wireless sensor applications and it is the only development kit targeting smartphone app developers. More information on the TI SensorKit is available on our applications and examples page. Kionix's EZ430-C7 Evaluation Board has been developed for use with TI's eZ430-F2013 MSP430 Development Board. This combination is ideally suited for the lowest-power, cost-sensitive application. This convenient USB form factor kit allows users to move quickly toward the creation of accelerometer-enabled functionality. The EZ430-C7 Evaluation Board holds Kionix's KXSC7-2050 accelerometer and plugs directly into an MSP430 Development Board, TI part number eZ430-F2013 (not included). A CD containing sample firmware for reading acceleration and step-by-step instructions is included. The KXR94 Development Kit, a stand-alone development platform, includes the TI MSP430F149 MCU. The KXR94 tri-axis accelerometer product delivers industry-leading sensor performance, both electrically and mechanically. The KXR94 Development Kit includes a KXR94-2050 accelerometer, TI's MSP430F149 MCU, onboard battery, and memory. Both parts are available through Kionix at salesna@kionix.com. About Texas Instruments: A global analog and digital semiconductor IC design and manufacturing company with analog technologies, as well as digital signal processing (DSP) and microcontroller (MCU) semiconductors. The Kionix Accelerometer Application and Firmware Development Kit is based on a Silicon Labs microcontroller, and provides a simple environment to quickly begin the development of applications and firmware that incorporate Kionix accelerometers. The Development Kit provides a common interface to Kionix evaluation boards. The included software provides an easy-to-use interface for displaying and recording acceleration data. Plus, a graphical register map allows the user to see and change the contents of control registers. About Silicon labs: High-performance, analog-intensive, mixed-signal ICs that enable analog-to-digital communication for consumer products, including set-top boxes, televisions, and cell phones. At the heart of many of today's most advanced devices there's a Qualcomm Snapdragon processor enabling a world of next-level experiences. Each tier of Snapdragon processors is designed to give mobile users a perfect balance of power and efficiency. The result is a broad spectrum of mobile technology that is innovative enough to carry the name Snapdragon. Learn more about Qualcomm Snapdragon processors here. With its low power consumption, low-pass filters, user-definable bandwith, high signal-to-noise ratio and excellent performance over temperature, Kionix's KXSC7 tri-axis accelerometer helps enable the CY8CKIT-014 PSoC® 5 FirstTouchTM Starter Kit's programmable system-on-chip architecture. The PSoC 5 FirstTouch™ Starter Kit includes software and example projects that take advantage of the kit's onboard sensors including the Kionix accelerometer, a thermistor, proximity sensing, and CapSense. The kit enables easy development via 28 general-purpose I/O pins, a 12-pin wireless module header, and Serial Wire Debugging (SWD). It also includes the PSoC Creator IDE. The CY8CKIT-014 PSoC 5 FirstTouchTM Starter Kit, priced at $49.00, is available at www.cypress.com/go/psoc5 or by contacting salesna@kionix.com. About Cypress Semiconductor: High-performance, mixed-signal, programmable solutions that provide customers with rapid time-to-market and exceptional system value.